Lots of beer coming my way recently. First, my friend came back from Barcelona. Then he got on a plane for an Atlanta business trip bringing me a few goodies. Next week to Denver. And back to Washington, DC in three weeks. You're going to hear a lot about those shortly. In addition to those, I made my own trip to Pittsburgh, Pennsylvania this past weekend and brought home a dozen new beers. Yep, they all arrived safely. I was thinking about some of the city names in PA while I was there. How do you know if the "burg" ends in "g" or "gh"? Beats the hell out of me. I guess you just memorize. So there's Pittsburgh but the state capital (and brewing city of this beer) is Harrisburg and the town I grew up in is Philipsburg and there are dozens more. Want to weigh in on your burg(er)? 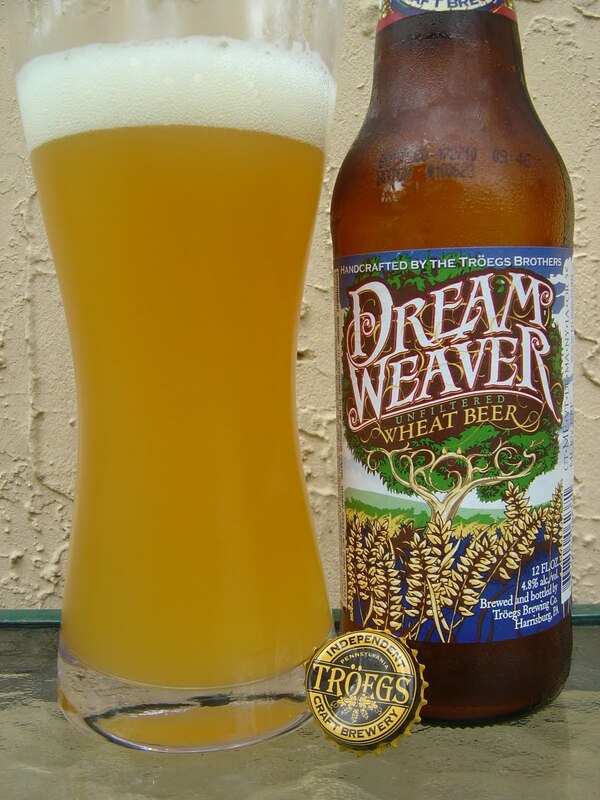 Tonight I'm drinking Dream Weaver brewed by Troegs Brewing Company in Harrisburg, Pennsylvania. This one came back from the Pennsylvania trip, which I made for my brother's wedding. This is the second beer I've had from this brewery after enjoying the Troegenator. The label depicts a tree in the middle of a wheat field, and calls itself an "Independent Craft Brewery". The label also says to pour 3/4 of the bottle into a glass, swirl, then pour the rest down the middle. Well, I'll admit I read that long after the beer was gone. Bottled 072710 at 09:46 Batch #100623. Lots of wheat and banana aroma. The flavors also start out fruity, but not just with the noticeable banana. There is plenty of juicy orange contributing as well. Lots of wheat, flavor and texture. And wow, what a nice creamy carbonation. I thought an initial hint of sweetness was going to dominate and stick around, but I was wrong again today. This was balanced, crisp and refreshing, not sweet at all. There are some spicy flavors but they are really just hanging in the background. What a tasty, flavorful and terrific beer! Get it if you can. 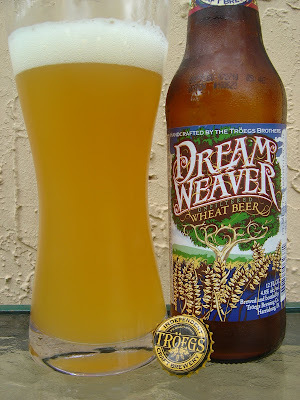 Dream Weaver is a nice beer, it was one of the first wheat beers where I could start to taste the banana. I have also thrown in into some pancakes with good success. Ah Hershey, so many fond memories, but that's for another day. I do like the banana, but really like the juicy fruitier fruits. Makes it much more refreshing in my opinion. You have a recipe or post for those pancakes? You want to do another post soon? Whenever you want. I had a bunch of this while we were on vacation in MA; I loved it. 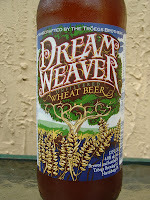 This was the summer wheat beer I was looking for when the Terrapin wheat beer failed me. I submitted it a recipe contest and got it served at a beer infused/beer geek brunch in philly. It was a lot of fun. As for another post, I did have KBS recently, which could serve as the sequel to my original post of the regular breakfast stout...let me know what you think. Yeah, Vanessa. Really good, right? BeerPancakes. I gotta go check out your recipe. And for sure, that sounds like a great sequel. Almost like Indiana Jones. Or even Fletch. I agree on the deliciousness of this beer. I will state that the wheatiness is quite a smack in the face...more than some other Hefes. 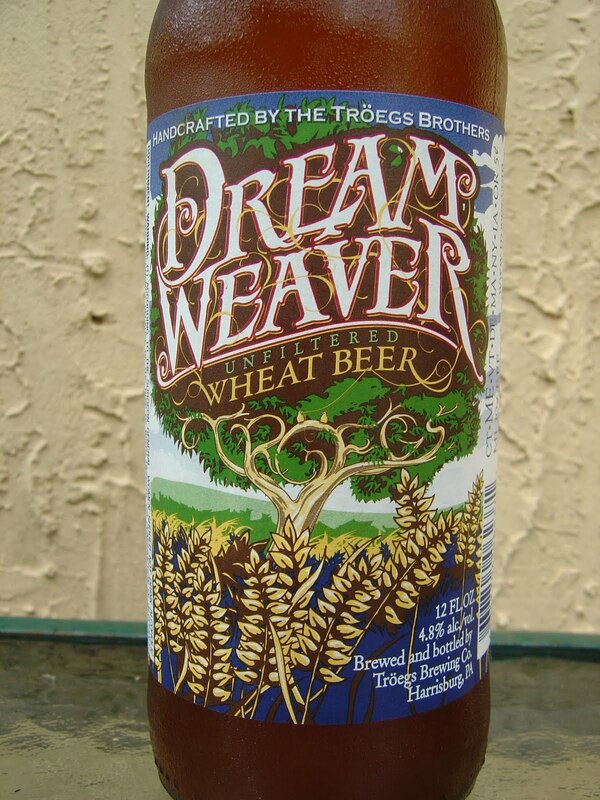 I gave this beer to a friend who is a craft beer newbie who likes wheat beers and it was a bit much for him. Yeah, quite a bit of wheat flavors, right? And wheat texture too. I personally thought that those flavors were balanced fairly well, though.